Les Halles is currently undergoing major urban renewal to see the ageing facilities rejuvenated, in a bid to reorganise and modernise the area. As the premier point of access in the French capital, with 750,000 rail passengers travelling daily, the existing site is no longer suitable for the major metropolitan structure. The redevelopment project will give Les Halles improvements to functionality of this monument to underground urbanism, re-integrating it in the urban environment and making it a more agreeable experience for everyone who uses it. After redevelopment, Les Halles will be more open to the city, easier to access, and more pleasant to walk in. There will also be more cultural facilities, more shops and more entrances to the station. This will make the whole quarter a friendlier place. The redevelopment combines elements of urban planning, architectural creation and in-depth renovation. To help the surrounding quarter breathe better, the public areas on the surface will be reorganised, with the above-ground elements rebuilt, pedestrian access improved and increased, and underground areas reorganized. New gardens that are a pleasure to visit; an extended pedestrian precinct; a new feature, the Canopy, that takes its inspiration from nature and connects the underground elements to the surface; simplified, more spacious pedestrian walkways; a bigger, more functional RER station; a brighter, more modern shopping centre; an improved subsurface road system. The two wings of the canopy will be laid out around a central patio, which will become the new heart of Les Halles. Some of the development features 6,300 square metres of underground retail space, a 2,600 square metre music conservatory, a 1,400 square metre hip-hop centre, a 1,050 square metre library and 1,000 square metres of amateur workshops and a cultural centre for the deaf and hearing-impaired. Aboveground, a large public garden will dominate the space – designed as a vast meadow dotted with flower beds and plants, framed on either side by wooded areas and equipped with playgrounds, benches, petanque courts, chess tables and much more. It will be more inviting, open and accessible to the public and will have more greenery than before. The uncluttered perspectives will create a feeling of space. 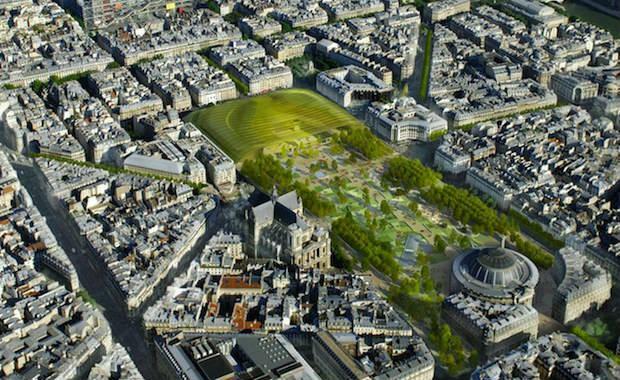 Fabienne Giboudeaux, the first deputy mayor of Paris in charge of parks and garden and the environment, said the new gardens of Les Halles will feel good to be in. "They will also be more environmentally friendly, with a deeper soil bed that’s better suited to the vegetation and recovery of rainwater for irrigation," Ms Giboudeaux said. Numerous obstacles and level changes will be removed to make the area more easily navigable for the mobility-impaired. Its branching pathways will also be extended to neighbouring streets. There will be a total of 138 more trees than there are today. A curvilinear building inspired by plant life, La Canopée, will cover Les Halles. La Canopée, which was designed by Patrick Berger and Jacques Anziutti, will shelter two buildings designed for public and commercial use. Mr Bergers said, "As an articulation between built space and the plant milieu, the Canopy will strike up a resonance between natural energy and urban energy." In 2002, Ville de Paris took the decision to redevelop the neighbourhood of Les Halles, undertaking an ambitious public consultation campaign along the way. This campaign lasted 8-years, raising a large number of questions along the way between project owners and designers. This deliberation period saw 8 public surveys, 518 public exhibition meetings and 60 advisory meetings take place. Anne Hidalgo, the first Deputy Mayor of Paris in charge of Planning and Architecture, said the Les Halles extended its reach well beyond its immediate confines. “That’s why the redevelopment project we’re undertaking is framed from a metropolitan perspective,” Ms Hildago said. With 3 RER lines, 5 metro lines, 14 bus routes and 750,000 passengers through it every day, the Châtelet-Les Halles transport interchange is Europe’s busiest underground rail station. With a total estimated cost of 918 million euros (plus tax), the operation will be jointly funded by its partners. With natural light a key design of the whole refurbishment, the existing forum will be redesigned so light can reach down through the escalator wells and openings in the canopy. The sides of escalator wells will be splayed to gather extra daylight. Balustrades on landings and staircases are in glass, as are the risers of the staircases themselves. The RER passenger thoroughfare will be made more spacious, providing fast routes for passengers to make connections and improved fire and safety evacuation systems. Another three entrances into the building will also be constructed to better connect the forum, garden and exterior. New lightings, materials and redesigned signage will make the complex more inviting and user friends. In total, the entire concourse of the building will be increased by 50 per cent. Having started back in 2002, the redevelopment process has by no means been a short term process. SEURA, the firm of architects led by David Mangin, won the internation competition for the development in 2005/2006 before technical works, planning, design and public surveys took place. Construction finally began in 2010 when the first installation of child play areas began. The development is expected to be completed in 2018 after finishing touches are done to the gardens and the surface road layout.